Apocalyptic ballads of separated lovers enduring a barren wasteland and a lonely pilgrimage to Mars haunt Murder by Death’s latest concept album. 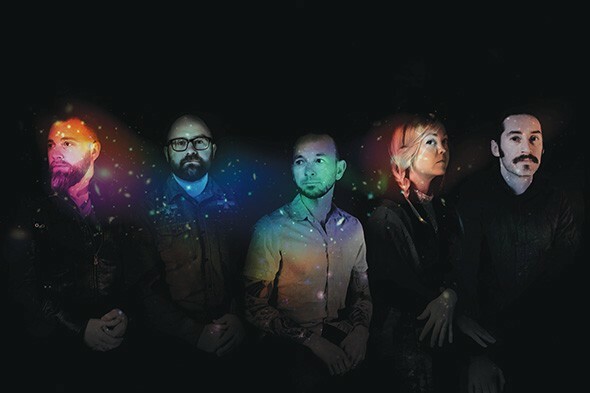 Murder by Death’s new album, The Other Shore, depicts an apocalypse that sends struggling Earth dwellers in search of life on Mars. Concept albums are Murder by Death’s thing. 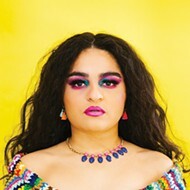 Named after a satirical comedy from the ’70s, the band likes to aim cinematic with stories of small Mexican towns beset by the devil and Dante-esque stories of sin. 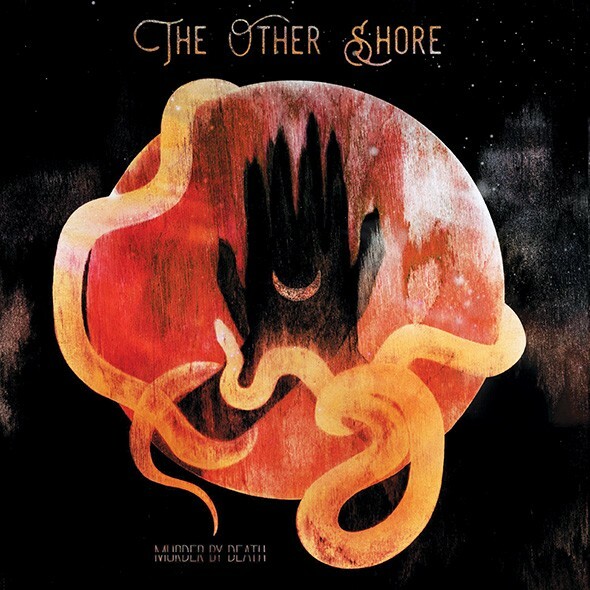 After a handful of run-throughs of Murder by Death’s newest effort, a space/Western concept album dubbed The Other Shore, I attempted to mine frontman Adam Turla for further hints about the hidden plotline of lovers splitting paths as the Earth crumbles. Murder by Death focuses the lens tight, preferring to delve into the intense emotions of two souls trying to navigate an apocalypse rather than getting mired in straightforward narration. It’s a smart decision, as many concept albums have been doomed by tedious, on-the-nose storytelling that drain the energy right out of the music. The gloomy marches and anguished ballads create a rich atmosphere, leading the listener to knit their own narrative threads. Sarah Balliet’s cello is pushed forward, as it often is throughout the album, as almost a second vocalist, a haunting echo of a lost lover. But despite my prying, Turla avoided dropping any firm clues on the hidden story. Not to be outdone, the following is my best guess at the plot of Other Shore. A man — let us call him The Man — stares out across a dying farmland. The Daughter plays on a rusted and sun-bleached play set, too young and too happy to recognize the encroaching creep of doom. The Man knows his limitations, that a more clever tender could have kept the farm alive a little longer or, failing that, would have already moved his family to more prosperous lands where The Daughter could have had a chance. If not on Earth, then somewhere beyond. His lover, who we will call The One Who Stayed, will not leave the family land. Not yet. Not while there is hope that the lands might one day be revived. Land is legacy; The One Who Stayed believes this, another archaic idea choking for its final breaths as it is consumed by the Earth’s now endless sandstorms. The Man clutches a flyer promoting jobs in Martian colonies for anyone who can make the trip and schools for the children who will one day transform the red planet into what Earth should have been. The One Who Stayed watches their coughing pickup truck limp off into the distance and worries about the fallen cities swarmed by millions of people pleading for a pass off the planet. The farm is empty and light now. And the land will yield. The One Who Stayed knows this. On the road now, The Man and The Daughter venture into the maw of mankind’s panicked escape. The cities are burning. The military has retreated to the launchpads to protect their own way out. The next window to Mars approaches. The docks are flooded with screaming voices and desperate parents pushing their babies over the security fences. “Just give them a chance,” these parents plead to soldiers far too young for their uniforms. "I write in landmarks, but for me, the story is flushed out with a few open ends." The Man often longs for the cleverness of the One Who Stayed to guide them through the madness, but it’s too late for that now. The Man knows his limitations but still believes he can find a way. He must find a way. The Daughter must know hope at least once in her lifetime. The One Who Stayed now knows the land is dead. A season has passed and not even a weed can breach the ravaged soil. 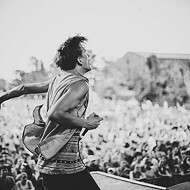 Nightmares come every night, calling The Man’s name out in confusion. Alone. Still alone. The forests burn endlessly on the horizon. The well has run dry, the pond evaporated long ago, even the brutal militias have withered and blown away. The One Who Stayed packs light and sets course for the family that is surely somewhere in space by now. Maybe the spaceships have their own schools and maybe The Daughter is prim and poised in her new uniform while The Man toils in the engine room, thankful for the simple, cleansing reward of hard labor. The cities are something different now. The One Who Stayed remembers the gleaming skyscrapers, the cultural centers, the feeling that the best days were ever ahead. But now they are only brutal way stations possessing slim entryways to the stars. Masses of starving humanity press forward as the uniformed boys warn them back. Shots startle the crowd, then chaos. The One Who Stayed is thankful for the riot and the fear and confusion. It was so easy to slip through while others clawed and died at the fence line. Surely it wasn’t this bad when The Man and The Daughter arrived so many months ago. As The One Who Stayed looks back down at the melee, there is a familiar flash of blond hair, but surely not. Surely not. The One Who Stayed must focus ahead, to the moment when the family is reunited. The labor that paid for the ticket is lonely and the vacuum of spacewalks only a dark reminder of the isolation of the dying farm, the lost legacy. Four years tick by as the One Who Stayed inches closer to where The Man and The Daughter surely await, where they’ve built lives and maybe The Man still holds a spot in his heart for The One Who Stayed. But back on Earth, The Man holds The Daughter close as the bones of the city snap and fall. Bright red plumes of fire streak across the sky as orphaned satellites reenter the Earth’s atmosphere. The boiling oceans and rivers now flood the barren lands. Humanity’s fight turns to a fatal resignation. The Man has his limitations, but at least he knows he tried. The One Who Stayed steps onto Martian soil and wonders which direction to find the family unwittingly left behind.